Team RKC once again took to the streets of Orlando to participate in the IOA Corporate 5k – dubbed “Orlando’s largest office party.” The firm has been participating in the event since its inception in 1995, and this year’s team captains, Carol Burns and Laurie Mesa, did a spectacular job. 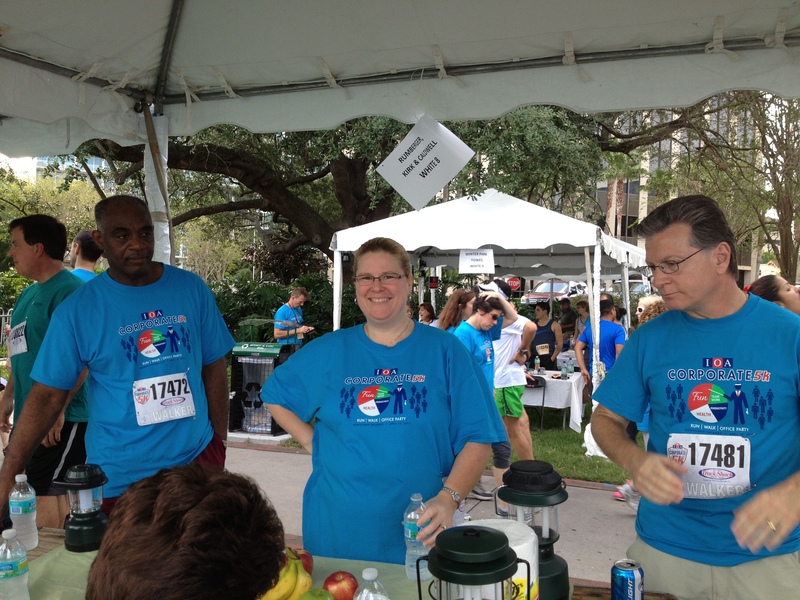 The 5k officials issued Carol and Laurie t-shirts naming them “CFOs” or “Corporate Fitness Officers,” but at RKC, they prefer the moniker ”Corporate Fun Officers,” encouraging everyone to have a great time running, funning, laughing, eating, drinking, walking and talking. RKC had a great group of runners, walkers and supporters this year, including returning regulars and new members of the RKC family. Ever fleet on their feet, the firm’s Managing Partner, Frank Sheppard, and his daughter ran with the pack along with Molly Cox and new team members, Lena Mirilovic and Rachel Lowes. Completing the RKC runners were fast trackers Tim Bench and Josh Brown. Josh had a great day, beating his personal best time while being cheered on by his wife and their boys. Having just returned from participating in the Boston Marathon, Lauren Carmody didn’t run the 5k, but supported Team RKC with her cheering talents. Paralegal Nancy Jordahl’s race tag indicated she was a walker, but her feet didn’t get that memo and they ran parts of the course, placing Nancy in both categories. True to the RKC spirit, walkers decided they would lead the pack, gathering early at the front of the walkers’ staging area. RKC administration, accounting and IT were well represented. Joe Mule, the firm’s Chief Operating Officer, joined the team again this year, helping to set and keep the pace. Kim Trimm and her daughter rolled with Toni Gouldbourn, and not to be beat, Tyrone Harvey and Sharon Ostrowski put the energizer bunny to shame walk the 3.2 miles in 45 minutes. And, while she looks sweet, the leader of RKC’s military support branch, commander Lisa Griffin pounded the pavement at a pace that was hard to match. New to the RKC team and IT Supervisor, Jim Spitzer, and his wife completed the walking squadron. Hot and sweaty but happy, the RKC team gathered at its lakeside tent for drinks and food, while team members shared 5k adventures and victories. Meanwhile, a few swans swam up to congratulate the team and even tried to join in the fun. When it was time, like a precision drill team, take down and clean up was swift, with Tyrone leading the way back to the office with a dolly full of supplies. While many law firms have joined in the Corporate 5k spirit over the years, RKC stands out as one of the law firm pioneers of the event, leading the law firm pack for most, if not all, 19 years of Orlando’s IOA Corporate 5K. As always, it is the RKC family’s team spirit that makes the event so special. And with that, another great RKC Corporate 5k is in the record books. Orlando’s largest office party! 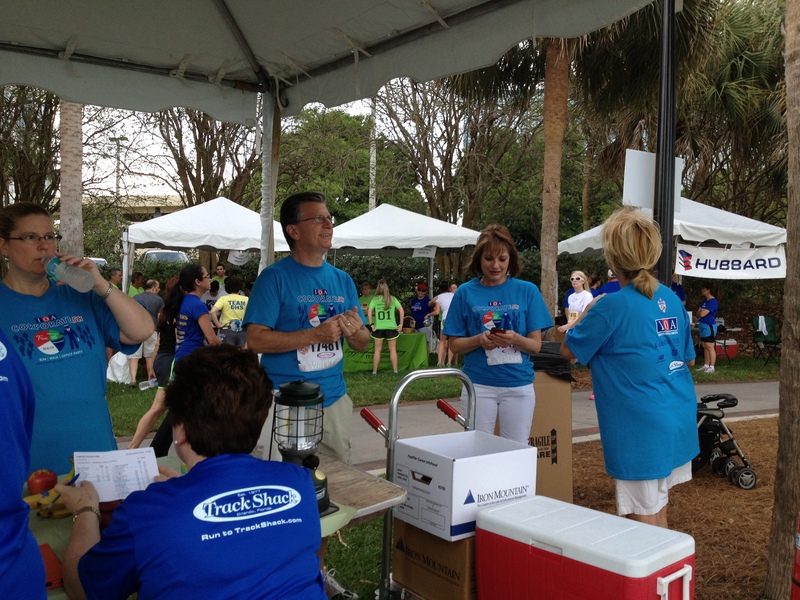 Held exclusively for Florida’s corporate community; businesses and non-profit organizations form teams and participate in the IOA Corporate 5k for camaraderie, friendly competition and celebrating with co-workers. The participating population is made up of over 15,000 runners and walkers from over 700 companies, non-profit organizations and 200+ CEOs.